Get absolute clarity on how to play to your strengths to be fully in 'Flow' - more motived, more productive and more profitable doing the work you love to do and are naturally talented in. There are eight Talent Dynamics profiles. 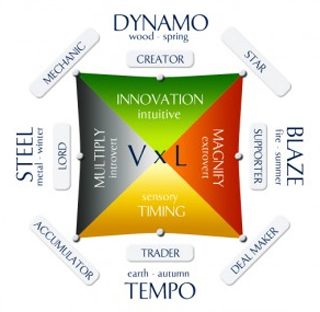 Each represents a certain mix of energy, thinking and action styles. The profiles are not a label but an entrance point to understand yourself in terms of how you act and think as well as the types of roles that you might be suited to.The Talent Dynamics profiles are the gate way to a more productive state called ‘flow’. Flow can be thought of as the path of least resistance, where you add the most value and get the most done.Each of the Talent Dynamics profiles has its own strengths and challenges. When working by yourself there is little you can do except understand why certain tasks and roles drain you, while other jobs excite and energise you. Yet no one truly works alone. Everyone has a group or team of partners, clients and suppliers.It is in the team where the Talent Dynamics profiles become extremely useful to help a team to gel together and spot potential opportunities to work better. As each of the Talent Dynamics profiles has its own strengths and challenges, they can be used together in a team setting to cover potentially challenging tasks and ensure that each team member gets into and stays in flow.